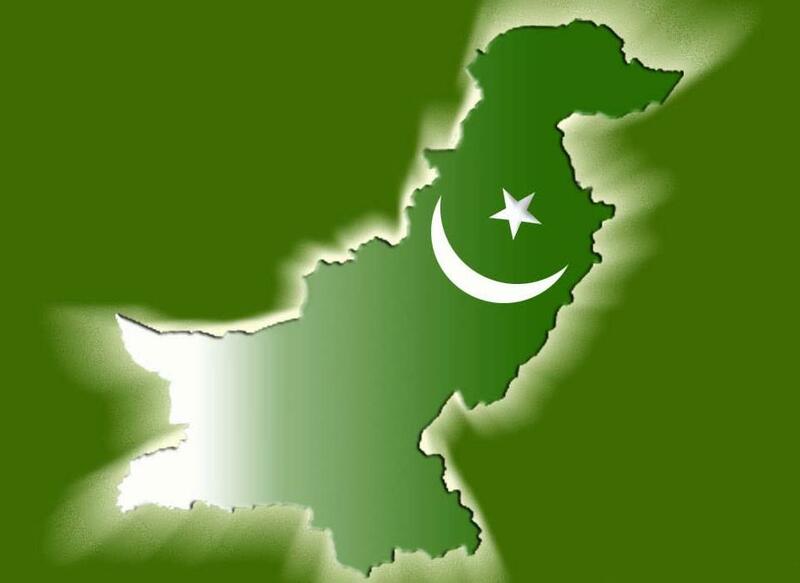 Suicide blast, Cycle bomb, Road side attack… all rocks Pakistan in favour of Jihad. Play the killing of men. 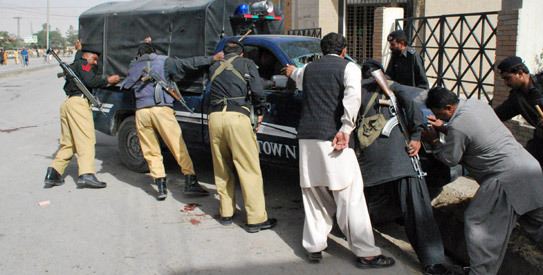 QUETTA: At least three people were wounded in a blast in Quetta on Monday, DawnNews reported. The blast occurred near Quetta’s Police Lines area. 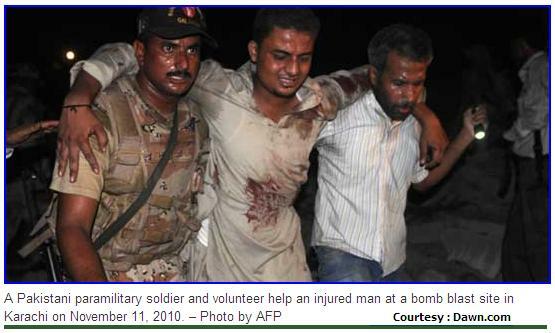 The wounded were shifted to the Civil Hospital in the city. 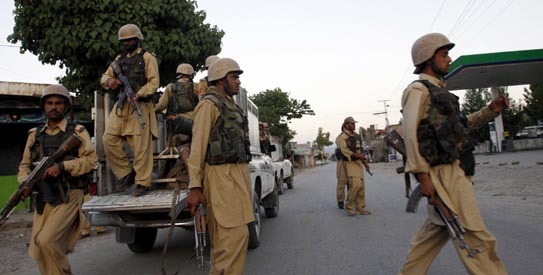 DERA ISMAIL KHAN: A roadside bomb struck a military convoy in Pakistan’s South Waziristan tribal area near the Afghan border, killing three soldiers, intelligence officials said. The officials said Monday’s attack in the Ladha area of South Waziristan also wounded four soldiers. The bomb was detonated by remote control and destroyed one military vehicle. The officials spoke on condition of anonymity because they were not authorised to talk to the media. South Waziristan was the main sanctuary for the Pakistani Taliban before the military launched a large ground offensive in October 2009. But attacks against security forces have continued in the area. Courtesy : Dawn, AP, AFP and Agencies. American-Pakistani plotter of 26/11 Mumbai Mayhem remorses for the bloody attacks. AFP | CHICAGO: An American-Pakistani who helped plot the deadly 2008 Mumbai attacks came close Thursday to expressing remorse for the bloody strikes in which 166 people were killed and hundreds more wounded. David Coleman Headley, who has admitted 12 terror charges arising out of the attacks on India’s financial capital, said during the Chicago trial of his friend, Tahawwur Hussain Rana, that he was no longer proud of the attacks. Towards the end of nearly three hours of cross examination, defense attorney Patrick Blegen asked Headley: “You were proud of it (the attacks) then? Yes,” Headley replied. “Are you still proud of it today?” Blegen asked. “No,” Headley replied without a moment’s hesitation. There was no explanation as to why he felt differently now, as the hearing then adjourned until Tuesday after a long holiday weekend in the United States. Rana is accused of providing Headley with a cover and acting as a messenger, with prosecutors alleging he played a behind-the-scenes logistical role in both the 2008 Mumbai attacks and another abortive plan to strike Copenhagen. Rana, a Canadian-Pakistani and Chicago businessman, has denied all charges, and his defense argues that he was duped by his friend, whom he had met in military school. The Mumbai attacks left 166 people dead and more than 300 wounded after coordinated strikes on high-profile targets by 10 heavily armed Islamist extremists. A twice convicted drug dealer, Headley formally admitted to the charges in March 2010 after prosecutors agreed not to seek the death penalty or to allow him to be extradited to India, Pakistan or Denmark on related charges. The Mumbai attacks stalled a fragile four-year peace process between India and Pakistan, two South Asian neighbors and nuclear-armed rivals, which was only resumed in February. 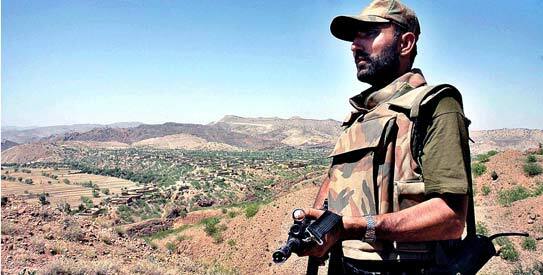 Fourteen troops killed in Khyber Agency ambush. The militant group is still unrecognized. 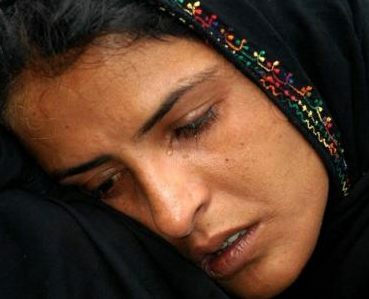 PESHAWAR, Monday 28th March 2011 | Rabi-us-Sani 23, 1432: Pakistan security forces suffered heavy causalities on Monday night when 14 of their soldiers were killed during a militants’ ambush in the Khyber Agency, DawnNews reported. Official sources said that the militants attacked security forces in the area of Akakhel and 14 soldiers, including a captain and colonel, died when a mortar shell landed near them. Security forces had been conducting an operation in the area for the past several days and had arrested a number of rebels, sources added. 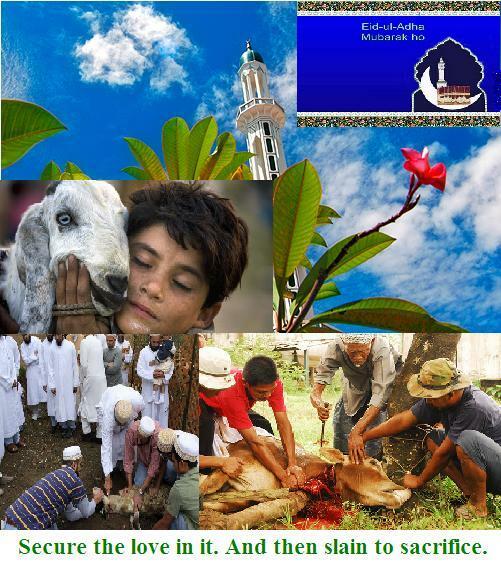 Eid-ul-Adha. Allah ho Akbar. Peace be upon the brutally slaughtered animals also. Friday blast again rocks Karachi. 17 killed, 100 injured, mosque badly damaged. 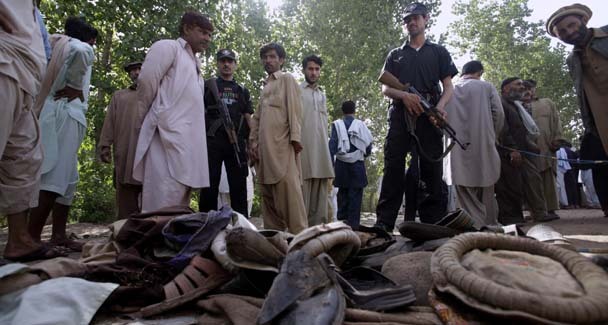 Arrest of banned Lashkar-i-Jhangvi militants may cause revenge. KARACHI: At least 17 people were killed and over 100 injured in a massive bombing that was preceded by a shootout and grenade attack at the Crime Investigation Department (CID) offices in Civil Lines on Thursday night. Among the dead was a woman from an adjoining neighbourhood, policemen posted in the CID and some personnel of the Frontier Constabulary deployed at a security post at the entrance of the offices located on the Beaumont Road. The blast took place at around 8.20pm in what is supposed to be a most secure area of the city, at a walking distance from the Chief Minister’s House and two five-star hotels located on the Club Road. 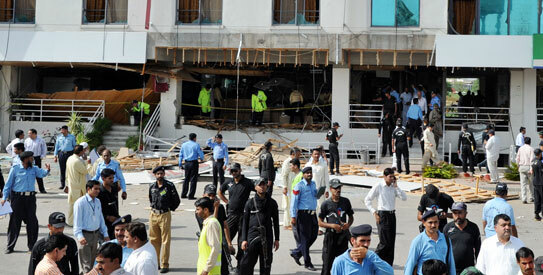 Sindh Home Minister Zulfiqar Mirza, who was among the first to reach the scene, said that the blast bore resemblance to Islamabad’s Marriott hotel blast of 2008. 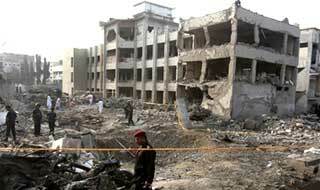 Soon after the blast, the banned Tehrik-i-Taliban Pakistan claimed responsibility. “Five or six attackers took out the guards present at the main entrance of the CID offices. One of them went inside the raised barrier and opened the gate. Meanwhile, policemen who were in the building opened retaliatory fire and the attackers rammed an explosives-laden truck of medium size into the second gate of the building,” a CID official told Dawn. The structure, especially residential quarters located across the road and around the CID offices, were also razed to the ground by the impact of the blast, killing and wounding many residents. The blast left a crater over 15 feet deep and 30 feet across. “I ran for safety inside the offices after hearing what appeared to be a shootout between two sides. It lasted 10 to 15 minutes, during which a small explosion also took place, and was followed by a massive blast”, said Abdul Razzaq, a labourer who was doing a paint job at the home of SP Naeem Shaikh, which caved in after the explosion. A mosque located inside the premises of the offices was badly damaged. An official of the Special Investigation Group (SIG) said the quantity of explosives used in the blast was less than that used in the blast in Islamabad on Sept 20, 2008, but more than the Lahore blast of May 27 last year. He estimated about 1,000kgs of explosives were packed into the truck. He said the vehicle used in the attack could carry a maximum of 2,000kgs of load, but the explosives must have been camouflaged. SSP Raja Umar Khattab, citing initial information, said the attackers had used a Shezore pick-up. He said there was no restriction on movement of such truck at the place because a multi-storey building was being constructed in front of the CID offices. A CID officer, who didn’t want to be named, said a lock-up had been damaged, but there was no suspect in it at the time. Saddar SSP Javed Akbar Riaz told Dawn that the attackers might have used the M.T. Khan Road and turned towards the Beaumont Road leading to the CID offices, to avoid the PIDC traffic signal. CCTV footage from cameras installed at the traffic intersection was being analysed to spot any suspect vehicle, the officer said. Investigators also found a chassis number, of a pick-up, from the scene. Two bodies were recovered from the debris several hours after the blast when heavy machinery was employed. The shockwave created by the explosion was so severe that the Met Office recorded a jolt measuring 1.3 on the Richter scale at 8.20pm. Only a day earlier, the CID had disclosed the arrest of seven militants belonging to the banned Lashkar-i-Jhangvi. “The men were involved in the murder of several Shia doctors in the city,” SSP Aslam Khan told journalists. Citing initial interrogation of the suspects, he said they were planning to carry out bombings on a procession of the community in the city. Karachi has seen a number of attacks since a Muharram procession was bombed on Dec 28 last year. Another team of the CID police had also arrested a wanted militant in the city. Iqbal Khan is said to hail from Bajaur, where he was affiliated with the TTP. Police officials said he was involved in the killings of security personnel and the bombing of army convoys in the tribal region. KARACHI: Staring blankly at what used to be his office, the plain-clothed police investigator recalled how he had worked long hours there trying to track down some of Pakistan’s most dangerous militants. The office was flattened in a suspected Pakistani Taliban suicide car bombing on Thursday at the compound of the Crime Investigation Department (CID), which focuses on apprehending militants who are bent on toppling Pakistan’s U.S.-backed government. “I arrested members of the Lashkar-e-Jhangvi,” said the investigator, who looked lost, his AK-47 rifle slung over his shoulder. LeJ is one of Pakistan’s most violent anti-Shi’ite groups and part of an al Qaeda-linked nexus of militants. They include the Pakistani Taliban, which claimed responsibility for the attack, which killed 15 people and wounded 100, and threatened more bloodshed. The explosion left a crater about 40 feet (12 metres) across and 12 feet (four metres) deep in front of the gutted building in Pakistan’s financial capital and biggest city, where senior militants were held and interrogated. The police investigator pointed out one of the rooms which held militants. It was reduced to broken concrete slabs and twisted metal. Parts of nearby buildings collapsed in the attack, which took place metres from the provincial chief minister’s house in a central district known as the “red zone” because of its high security status. The U.S. Consulate and five-star hotels are nearby. A security guard knelt in the rubble and sifted through a pile of bullet casings. Police said the militants first opened fire, as they sometimes do during such attacks. Official documents were strewn across the rubble. Security officers and rescue workers tried to steady themselves over shaky chunks of cement as they searched furiously for possible survivors. A pair of sandals raised hope, but to no avail. A few feet away a group of security officers grunted as they pushed away a huge block of cement. “Allah-u-Akbar” (“God is Great”), they shouted, hopeful they had found a survivor. Courtesy : Dawn, Reuters & Agencies. 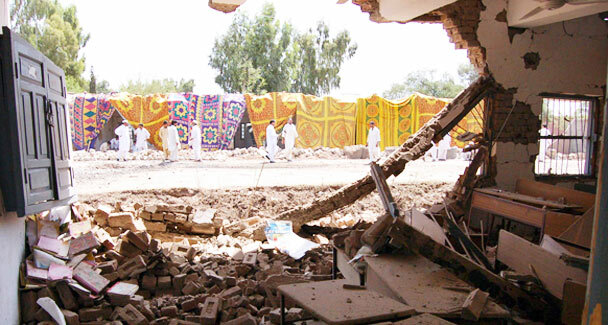 Local residents survey the damages of the police station after the suicide bombing in Kohat on Sunday, April 18, 2010. – Photo by AP. 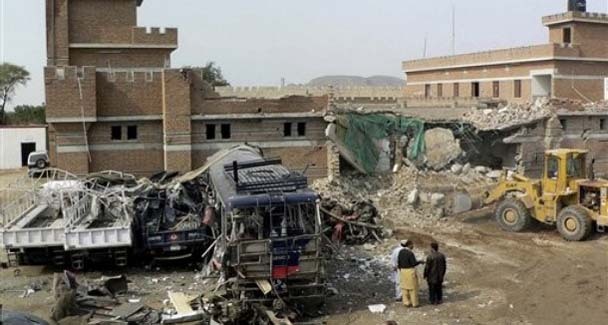 At least 41 people were killed in twin bomb blasts at an Internally Displaced Persons’ camp in Kohat in northwestern Pakistan on Saturday, officials said. Local officials told Xinhua that the death toll could rise as more than a dozen of the rest 64 injured people are in critical condition. Earlier in the day a bomb went off at the registration point and the second blast occurred ten minutes later when people rushed to the scene to rescue. The blasts took place when food relief were being distributed to the displaced people who fled from a military operation in Orakzai tribal region, police said. Gunshots were heard soon after the blasts, witnesses said. 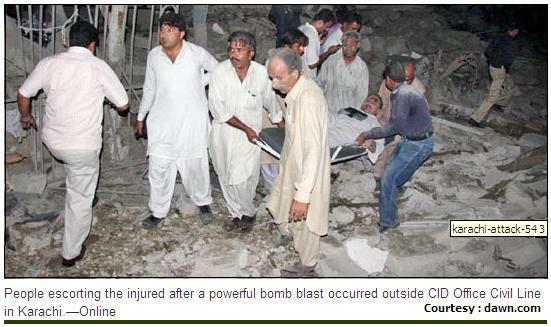 The private channel SAMAA TV lost its correspondent Azmat Ali Khan in the explosions. No group claimed responsibility for the attacks but Taliban are blamed for such attacks. MIRAMSHAH: The Pakistani Taliban claimed responsibility on Sunday for a suicide attack on a police station in Karak that killed 4 people including two policemen. In addition to the dead, more than two dozen people were wounded, most of them police officers, when an attacker detonated a pick-up van on Saturday at the gate of the main police station in Karak. “We have done this,” Taliban spokesman Azam Tariq told AFP by telephone from an undisclosed location. Karak lies 150 kilometres (94 miles) southeast of Peshawar, the capital of North-West Frontier Province. 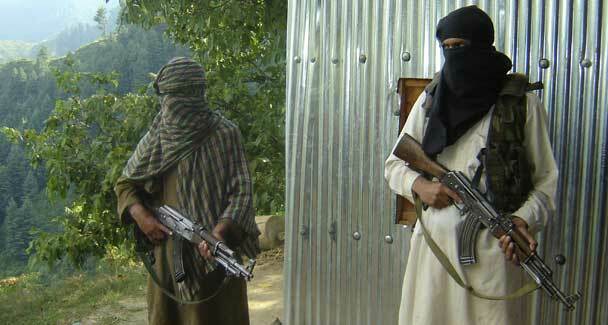 The Taliban have claimed and been blamed for most of the bomb and suicide attacks to have taken place in Pakistan. Such attacks have killed more than 3,000 people since July 2007.